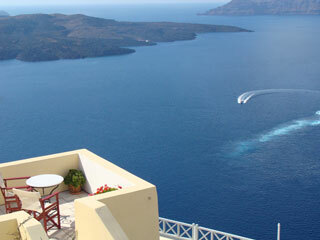 Cori Rigas Apartments are located on the caldera cliff of Fira Town. This complex was used as a captain’s housefor 250 years. The present proprietors are the forth generation of Masters who except for the sea they mastered the Arts too. Their love for the tradition and their sentimental bonds with the building forced them to restore it and transform it to its original form so as life to emerge once again at the old captain's house. The building has been restored by local masons according to the techniques of their forefathers, using local volcanic materials as well as wood and marble, making it a vivid sample of the traditional Santorini architecture. Cori Rigas is a complex of traditionally restored, individual Apartments, properly equipped for luxuriously relaxing holidays. The Terraces of the Apartments have the most breathtaking sunset view in the world, not to mention the glorious Aegean Sea and the Volcano. All the Apartments have the refinements of a fine traditional accommodation and are furnished with unique handcrafted furniture. The décor comprises of Art, painting and sculptures from the proprietor’s collections. On the beautiful Terrace of the Art Café that is part of the Complex, you can enjoy coffee, cool drinks, snacks and Breakfast surrounded by the artistic creations of the proprietors. The Staff are friendly, helpful, well-informed and well-trained to meet all your needs. The relaxing, artistic atmosphere you find at Cori Rigas Apartments ensures a pleasant and unforgettable stay.